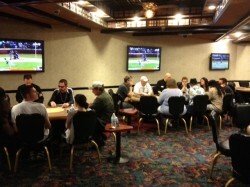 The temporary poker room at IP during construction of the Linq project is currently enjoying Quad-a-Palooza. In the weeks leading up to the World Series of Poker, grinders all over Vegas start making big plans. Even small-stakes guys like me and my friends want a piece of the action. But with the major online sites shuttered for US players, we must hunt for a way to qualify for a bracelet event. WSOP Executive Director Ty Stewart told reporters that Caesars properties would increase satellites leading up to the series. Caesars Palace just launched its WSOP Warm-Up, running through May 20, with tournaments as low as $130 that have $20,000 guaranteed prize pools and $1,000 WSOP seats. My friends and I decided to skip those tournaments for now — thinking we’d hit a few of the smaller Caesars properties to increase our chances of scoring a seat. These rooms wouldn’t be as packed with local grinders, we figured, and the games would be less volatile. With the construction of the Caesars’ Linq project underway, the Imperial Palace poker room moved from the front of the casino, by which all the tourists would stumble, to a rather inconvenient spot up on the third floor. “I don’t get it. They had such a great location,” said one of my poker buddies — an out-of-towner who takes most of his vacations to Vegas. As we weaved our way through the slots and pit games, past a stretch of freshly hoisted dry wall toward the main elevators, a fire alarm was blaring, but no one seemed concerned. We took our chances to get on one of the creaky elevators and survived the trip to the third floor, where some guy was hawking romance novels near a bank of slot machines roped off for tournament play. We eventually found the “new” IP poker room down the hall. The carpet was dark floral, the air musty Marlboro. We spotted only two tables of 2-4FL with a half-kill. It was 1:30 pm on a Wednesday, so we cut them some slack. “This is the busiest we’ve been in the last four days,” the poker room director tells us. Yikes. Could you tell us how to win a $1,000 WSOP seat? Oh that promo ended Monday, he said. So no seat, but there was a high hand jackpot that paid more than $1,000, and something called “Quad-A-Palooza,” with progressive payouts up to $599. So we ducked out of IP and headed past the construction-site chain-link fences, through the particle dust and under the scaffolding, to Harrah’s, once the signature establishment of the Caesars empire, now home to a glass-encased poker room that’s something of a center-strip artifact. Inside, with the likes of Doyle Brunson, Johnny Chan and Stu Ungar glaring down at the felts from their bizarre technicolor portraits, we spotted two 1-2NL games running — standard stuff, with stacks between $50 and about $500. 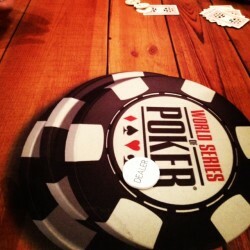 This year, there are seven WSOP events with a $1,000 buy-in, including a two-day tournament just before the main event. We decided our best shot was at Bill’s Gamblin’ Hall & Saloon, where they have the cheapest live poker on the strip: .50/$1NL. Minimum $20 buy-in. There until May 25, they’re offering a $1,000 seat to anyone who makes the high hand of the day, minimum quads or better, using both hole cards. No seat was awarded the day before, so the prize rolled over, and there were 2 seats available. Low risk. Low variance. Big potential reward. Let’s gamble. My friend and I plopped down at one of the three booze-loosened tables. I’ll just play pocket pairs, suited connectors, and anything that can make a high hand, I told myself. So I opened my first pot in late position with KQo, which is none of that, and the drunk to my left promptly 3-bet. Sigh. I might need another 20 bucks. I played a few more pairs and suited connectors and found myself stuck $100 in a couple hours. So much for low risk. My buddy won a few bucks, but alas, he didn’t win a WSOP seat either. The entire day, only one hand qualified, which meant there was another rollover. By the start of the series, there could be a pile of available spots. Maybe we’ll head back before the WSOP starts on May 27 and give it another shot. We still have a couple weeks to sneak in. Otherwise, I might find myself grinding that slot tournament.